Iraq asked the WHO, to attend experts. 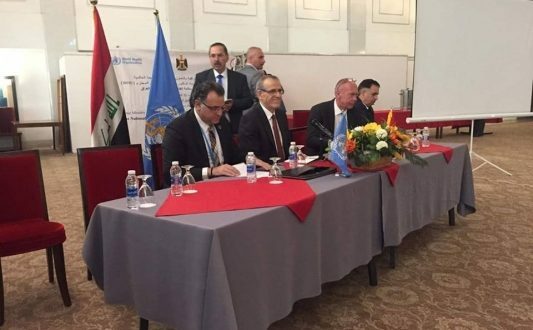 "Under the patronage and presence of the Minister of Health and Environment Alaa Al-Din Al-Alwan and specialists in the Ministry and the World Health Organization, the Ministry of Health held an expanded meeting to assess the safety and quality of food in Iraq in cooperation with the World Health Organization in the Good Hotel in Baghdad." "Iraq is one of the countries that have been keen to join the countries that are concerned about the country's safety, including Ebola, and to evaluate its status in particular with regard to the International Health Regulations, including national capacity and ability to prevent and respond to the spread of such diseases, Rather than the self-assessment adopted by some countries. " "Assessing food safety and focusing on how to control drugs is important." He noted that "the demand from the World Health Organization to attend the experts to conduct the evaluation process in a manner similar to the way that were made in other countries , " and expressed his gratitude to Dr. Adham Ismail , representative of the World Health Organization and members of the organization in Iraq and the regional center of the organization in Cairo and the Center for Organization in Geneva "
and noted "WHO members will make initial recommendations, how to implement these recommendations and overcome weaknesses in food safety."